Responding to the Critics| A Response to Robert Kramer - #3-- Will Jesus Come on the Clouds? Will Jesus come out of heaven on literal clouds? A Response to Robert Kramer– #3 — Will Christ Come on Literal Clouds? Will Jesus one day be seen literally, bodily coming on the clouds— literal clouds? Be sure to read the previous two installments of this brief series as I respond to some recent objections against the truth of Covenant Eschatology. #1 #2 Robert Kramer, who writes and posts the “Second Thoughts” electronic journal says that preterists, those who believe that Jesus’ prophecy of the end of the age and his coming, are all fulfilled, are misguided and that we abuse the text of Matthew 24. An objection that Mr. Kramer lodges is that Jesus will one day “break through the clouds” literally and physically. I suggest that Mr. Kramer is woefully ignorant of how Jesus intended for that language to be understood, and how the ancient Jews understood that language. Western readers of the language utilized by Jesus are prone to take the language of coming on the clouds literally, and therefore demand that Jesus will one day come out of heaven, in a 5’5″ Jewish man’s body, riding on a cumulous cloud. Unfortunately, this view totally ignores the Old Covenant use of that language, and to ignore that OT source and usage when Jesus used it, will invariably lead to misunderstanding and false interpretations– such as Mr. Kramer’s. In the OT, only YHVH “rode on the clouds.” That language depicted Deity, the activity of God. And yet, YHVH never literally came out of heaven riding on a literal cloud. Even some of the most adamant opponents of Covenant Eschatology admit that the language of coming on the clouds does not suggest a literal coming on literal clouds. Curtis Cates, who wrote one of the most illogical, misguided attempts to refute preterism, nonetheless wrote concerning Matthew 24:30: “When the Romans destroyed Jerusalem and the Temple, certainly those where were connected to the Jewish economy (Jews and God fearers [proselytes] would mourn (Matthew 24:30).” On page 27, commenting on Matthew 24:30 he says that the people hearing or reading Jesus’ words would not think of a literal bodily coming of Christ when they read of him coming on the clouds: “such language does not refer to a personal appearing, visible to everyone, but rather to His coming in judgment of corrupt Israel to destroy Jerusalem through the Romans.” Curtis Cates, The A.D. 70 Doctrine, Olive Branch, Ms., Cates Publishing, 1995)27. This is one of the very few things that Cates got right in his little book. It truly is one of the most illogical, baseless, presuppositional bits of literature one can imagine. It should be listed under Theological Fiction. Read Psalms 68: “Let God arise, Let His enemies be scattered; Let those also who hate Him flee before Him. 2 As smoke is driven away, So drive them away; As wax melts before the fire, So let the wicked perish at the presence of God. 3 But let the righteous be glad; Let them rejoice before God; Yes, let them rejoice exceedingly. 4 Sing to God, sing praises to His name; Extol Him who rides on the clouds, By His name YAH, And rejoice before Him.” (See also Psalms 104). It should be noted that in Matthew 24:30 Jesus is clearly drawing on Daniel 7:13-14 and the promise of the coming of the Son of Man on the clouds of heaven. What cannot be missed is that the vision of Daniel 7, no matter what else we might think, is restricted to the days of the Roman empire. Daniel saw four beasts, and the fourth beast, the sea beast, is none other than Rome. So, Daniel 7 predicted the coming of the Son of Man on the clouds of heaven. Jesus cites Daniel 7 in Matthew 24. Daniel 7 cannot extend beyond the days of the Roman empire, and Jesus confirmed that restriction when he said that his coming would be in the first century generation (Matthew 24:34). The point is that when Jesus said he was coming on the clouds, this was a claim to Deity. It is one of the reasons why the Sanhedrin “came un-glued” when Jesus said they would see him coming on the clouds (Matthew 26:64). I think N. T. Wright has caught the flavor well as he comments on Matthew 26:64, where Jesus reiterated his promise to come on the clouds of heaven. He comments on Jesus before the Sanhedrin, as he quotes from Daniel: “Jesus’ response, then, resonates with ironic power. Now, at last, when it can no longer be misunderstood, he can retell the story of Daniel 7 in his own revised version. He is claiming to be the representative of the true people of God. Like the martyrs on trial before the pagan tyrants, he is refusing to abandon the ancestral faith and hope, even if it costs him his life. …He therefore declares that Israel’s god will vindicate him; and that vindication will include the destruction of the Temple which has come to symbolize and embody the rebellion of Israel against God, her determination to maintain her national exclusivism at the cost of her vocation.” (N. T. Wright, Jesus and the Victory of God, (Minneapolis, Fortress, 1995)524). The fact is that Jesus told the Sanhedrin– not Caiaphas personally, but the Sanhedrin as a body, as indicated by the Greek text– that they, not some future generation far off, but they would see him coming on the clouds in fulfillment of Daniel! So, what we have is this: Mr. Kramer is guilty of totally ignoring the OT source– and nature– of the language of riding on the clouds. He has imposed a crassly literalistic interpretation on metaphoric language. He has ignored the temporal framework of Matthew 24:30 and that is the days of the Roman Empire. Those parameters are set by Daniel 7. He has ignored the emphatic time frame established by Jesus in Matthew 24:30-34– his own generation. So, Robert Kramer’s appeal to Jesus’ prediction of his coming on the clouds as an objection against Covenant Eschatology is a false and fruitless objection. We will examine another of his objections in the next installment. 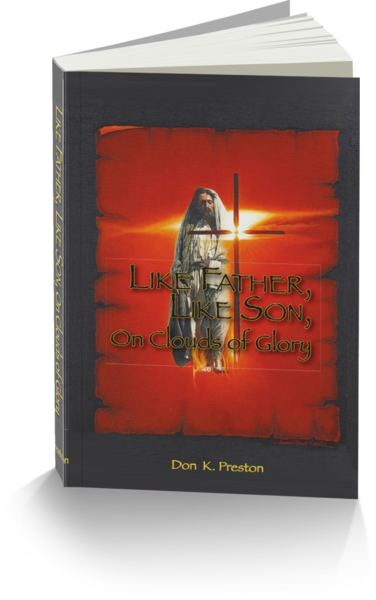 For an excellent, extended study of the language of coming on the clouds, see my Like Father Like Son, On Clouds of Glory book. It is extremely helpful in explaining the language that Jesus used. This book contains a great study on the language of coming on the clouds! Order your copy today!